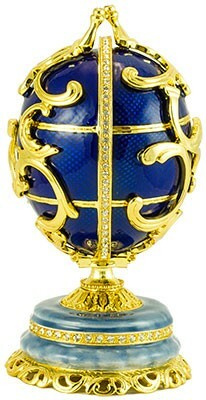 A Russian style egg is one of as many as sixty-nine jeweled eggs created between 1885 and 1917. The most famous are those made for the Russian Tsars Alexander III and Nicholas II as Easter gifts for their wives and mothers (though these were not the only gifts they gave for this occasion). Original eggs are exhibited in the museums all over the world including Hermitage Museum in St.Petersburg and Metropolitan Museum of Art in New York. 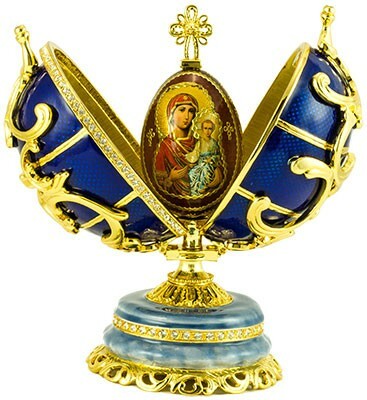 Egg-boxes in Russian style is a true flight of imagination, the supreme work of art. Every Easter egg in Russian style is unique and in its own way elegant. The tradition of the famous firm is continued by manufacturers in St. Petersburg. Masters achieved very high results in making small copies of the egg-boxes with surprises and watches. Materials used: alloy of copper, tin, brass and gilding. Technique: filigree, enamel, inlaid with Swarovski crystals produced in Austria.